When the weather gets hot, what better place to be than on the water with your dog, catching a nice breeze while enjoying the offshore sights, whether it be a whale watch, or a nature cruise, or just breaking free of “the hard,” as sailors call terra firma, and seeing the world from a different perspective. That’s the joy of pet friendly boat cruises. And while only one major transatlantic cruise line allows pets (Cunard’s Queen Mary 2), there are plenty of other less grand (and certainly less expensive) options that offer you, your family, and your dog a wonderful few hours together while taking in the fresh air and enjoying the beautiful vistas that only boat cruises can provide. This is a great way to experience the amazing natural beauty of the Maine coast, Acadia National Park, and Frenchman’s Bay. The Acadian leaves Bar Harbor daily for a two-hour nature cruise to find seals, porpoises, and eagles, as well as offering stunning views of lighthouses and coastal mansions. Located on Pier 21 near the historic Strand District in downtown Galveston, Dolphin Baywatch Tours is open seven days a week every day of the year (depending on the weather), offering 45-minute tours of Galveston Harbor to view dolphins in their natural habitat. The Baywatch departs every hour from 10 am to 5 pm and charges only $10 for adults and $5 for children. Best of all, pets ride for free. A Sunday Champagne Brunch Cruise with your favorite buddy. How much fun is that?! Even your dog gets a buffet to choose from. Cruise the San Diego Bay for two hours with unlimited Champagne, mimosas, coffee and tea. There’s even a Doggie Costume Contest with prizes. Best of all, a portion of the proceeds goes toward helping the Helen Woodward Animal Center. Cruise date is Sunday, October 21, 2018. $94 per person. Cape May Watcher has a cruise for everyone. They include a Dolphin Watch Cruise, a Sunset Dolphin Watch, a Whale & Dolphin Watch Cruise, a Sunset Lighthouse Cruise, and a Prime Rib Dinner Cruise, among many others. Prices range from $25 to $35 for children and $35 to $95 for adults, depending on the cruise. Dogs must be leashed and are allowed on the vessel outside the cabin. 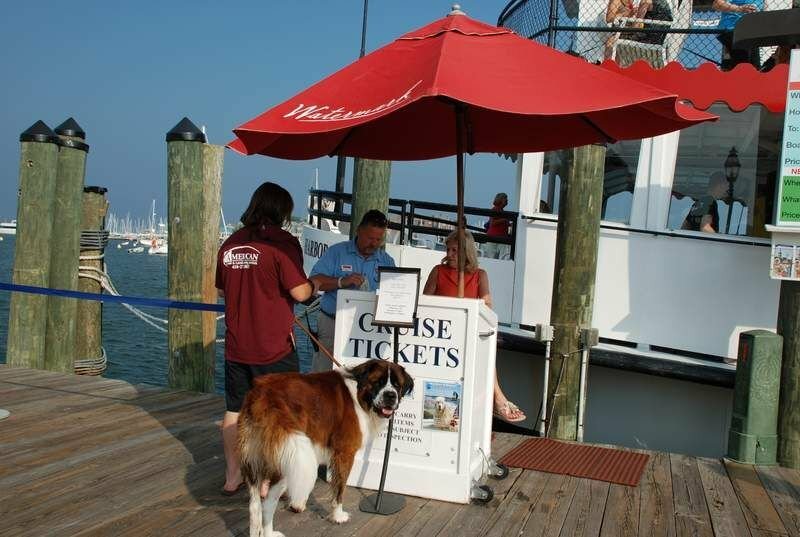 Cruise the Baltimore Inner Harbor on the Annapolitan II or hop on the Harbor Queen to check out the Annapolis Harbor with your favorite animal in tow. Both cruises offer 45- and 90-minute sails. Prices range from $19 to $26 for adults and $7 to $12 for children. 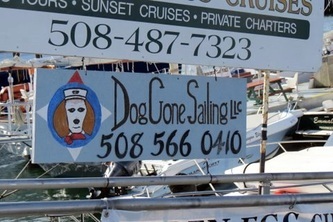 Dogs sail for free and are welcome on a leash. Some cruises even host animal charity fundraisers. Now that’s what we call pet friendly! See Provincetown from the proper perspective: from the water with your pooch by your side. Sail to Long Point, which is the site of the original Provincetown settlement. Go ashore and picnic on the beach or take a swim off the boat while it’s moored. Trips vary from sunrise and sunset sails to half-day and full-day sails with whale watching included. 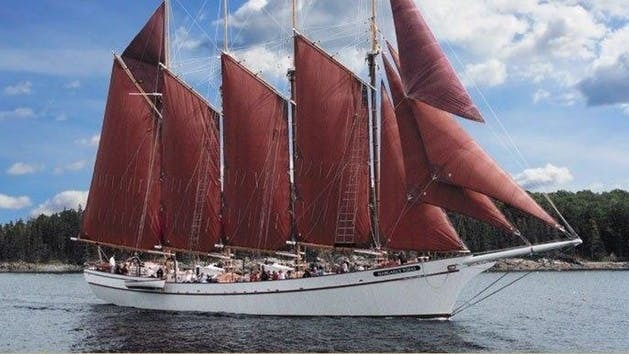 Another way to see the beautiful Maine coast, Acadia and Frenchman’s Bay is on a Windjammer cruise. Cruises range from 1 1/2 to 2 hours and are available from mid-May through October. Prices range from $42 for adults, $32 for children, $7 for toddlers, and $39 for seniors. Dogs are free and must be on a leash. This is a spectacular cruise and highly recommended. The Adirondacks in New York State is one of our favorite vacation destinations. Its beautiful mountains and sparkling lakes offer fantastic opportunities for hiking, fishing, boating, camping and other recreation. We highly recommend the pet friendly Lake George Shoreline Cruises. 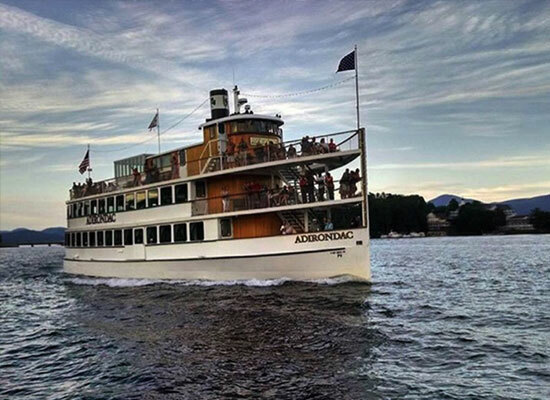 Options include a pet friendly Evening Sunset Cruise, a Historic Sightseeing Cruise and a Family Fireworks Cruise. Prices range from $18 to $30 for adults and $9 to $14 for children. Dogs are free and must be leashed. Learn about Chicago while cruising on Chicago’s waterways with your dog on your lap.If you like the sound of that, then Mercury’s Canine Cruise has got you covered. They even include dog-friendly highlights in their narrations about Chicago’s rich past and architectural gems. Cruises depart on Saturdays and Sundays from July 7 through October 7 at 10:15 am. Adults $35. Kids $14. Dogs $8. 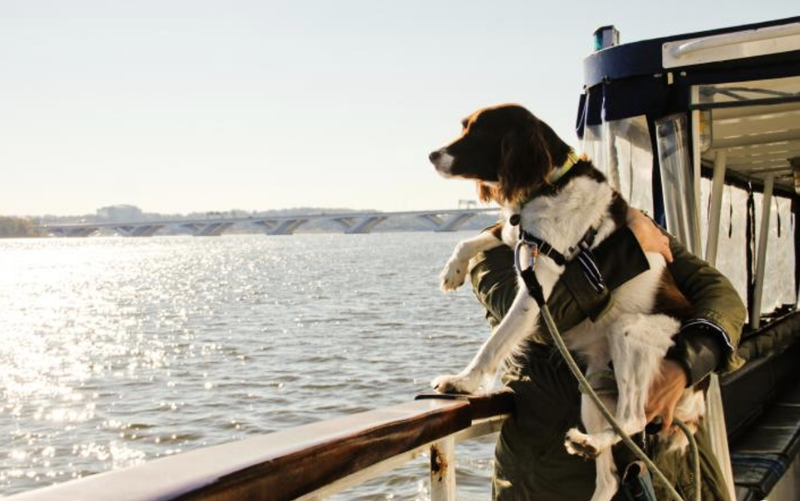 Beat the Washington heat and take a 45-minute cruise with your favorite four-legged friend on Potomac River Boat Company’s Canine Cruise. Explore Alexandria’s Seaport on the Potomac and we think you’ll come to the conclusion that it was time well spent. Adults $20. Children $15. Seniors $19. Dogs ride free. Want to go on a pet friendly Eco-tour down in the Florida Keys? If so, check out Shell Key Shuttle, which operates out of St. Pete Beach. 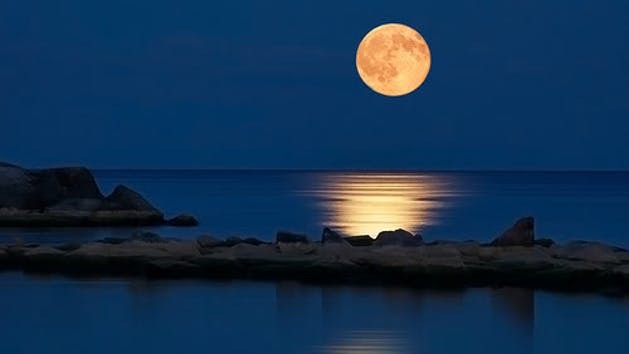 They offer a pet-friendly “Howl at the Moon” Sunset Cruise on which you can spend an hour and a half slipping through local waterways, including the beautiful barrier islands south of Pass-A-Grille. $25 for “well-behaved” adults. $12.50 for “muzzled” children. Dogs, naturally, can do what they want and ride for free. Of course, you can’t be on the water all the time, so if you also need a pet-friendly hotel during your travels, Petswelcome is here to help. In the meantime, all of us at Petswelcome wish you fun on the water! Anchors aweigh, hut-to-peen and smooth sailing! Not sure what all that means but Captain Jack McCarthy said it and so it sounds suitably salty to us.